Below we have provided information on how to best find your way to our store. You can go by car, public transport or of course by the best way there is: on your bike! We hope to welcome you sometime soon. Coming from north, east or south via motorway A5, leave A5 at "Westkreuz Frankfurt" for motorway A648 (direction "Wiesbaden"). Follow A648 to "Eschborn/Sossenheim", exit and turn right to "Eschborn". At the crossroad, go straight on following the left lane. A little further, turn left and follow the highway to "Kronberg". Coming from west via motorway A66, leave A66 at exit "Eschborn/Sossenheim" and turn left to "Eschborn". At the crossroad, go straight on following the left lane. A little further, turn left and follow the highway to "Kronberg". 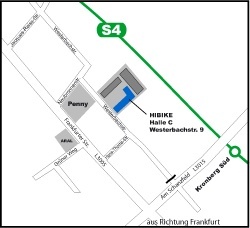 All directions: In Kronberg, follow the main street ("Frankfurter Str."). Turn right at the "Penny Markt" and then make one more right turn into "Westerbachstraße" you'll find us on the left hand side on the No. 9 lot in "Halle C".